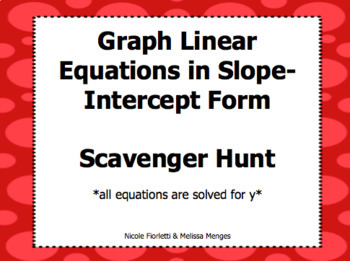 A fun and engaging way for students to practice graphing linear equations. 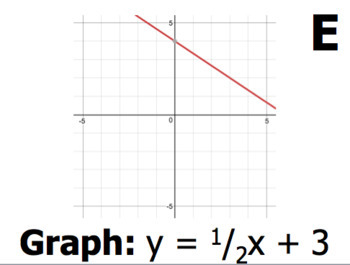 Students will graph linear equations that are already in slope-intercept form. Scatter cards in or out of order around the room. 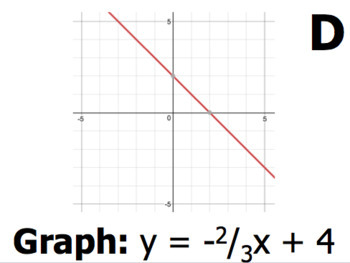 Cards will spell a twelve letter word (demographics) if students graph all lines correctly and once finished, they will end up at the card they started on. We love this activity because if students cannot locate their graph, they will be forced to ask the teacher to correct their error and get them back on the right track. You can even turn this into a race for motivation! This is a great activity for student self-assessment.